We have previously spent some time explaining the concepts of the “Transient Block” and “Proof-of-Transactions”. Today we would like to shift our focus to our design of “Paysplit”, which essentially presents the economic model of Saito network. To begin with, it’s always useful to start with the “why”; why is this ever needed in the first place? Scalability is one of the top issues within the blockchain space, and most platforms trying to tackle that from a technical perspective, Lighting Network, Sharding, Plasma etc. However there is a fundamental economic problem that the community largely overlooked. For example, under PoW, although both miners and nodes are contributing to the network (hashpower and bandwidth), only the miners receive a reward. Given the misaligned economic model, the current network relies on the charity of nodes to provide bandwidth, and this is certainly not scalable. Thus Saito directly tackles this problem from an economic angle, by providing a fair share of rewards to all participants of the network, the users, the nodes and the miners. We introduce four new concepts here: the burn fee, the transaction fee, the paysplit, and the golden ticket. Under Proof-of-Transactions, any node that creates a block is required to pay a “burn fee” set by the network. The burn fee is set to a high value immediately after a block is found, and decreases until it hits zero. Utilizing this approach makes attacking the network expensive, as it forces attackers to burn their own capital to create blocks with fake transactions that include real fees. However there is a consequence with this approach, the network will run out of money eventually. To avoid this undesired deflation crash, there needs to find an effective way to inject tokens into the network. Where does Paysplit Sit Under? 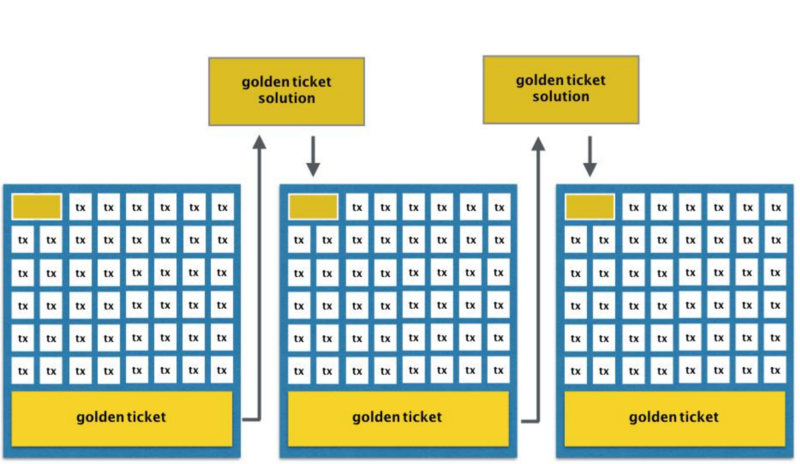 Whenever a node produces a block, it aggregates the transaction fees and pays the burn fee, the remaining transaction fees are put into a “golden ticket” which comprised of two parts 1) a computational puzzle for miners to solve 2) a vote to increase, decrease, or hold constant the “paysplit” of the reward between nodes and miners (the percentage of total reward that is paid to miners). Who can Vote for the Paysplit? The node that bundles the transactions into a block can certainly vote. Network users who originate transactions can vote also, however it is not a compulsory. Transactions that do not vote may be included in blocks that vote in any direction; on the other hand, transactions that are opinionated can only be bundled by nodes that agree with their politics. The votes are weighted by transaction fees. As discussed above, apart from the paysplit vote, the golden ticket also includes a computational puzzle. The difficulty of that puzzle is determined by the current state of the paysplit. Every time a golden ticket solution is fulfilled, the paysplit and puzzle difficulty adjust minutely in response to the two votes. If the network votes to change the paysplit, everyone must adjust simultaneously. Any block that does not comply is orphaned from the network. This is because the consensus layer of the network enforces that blocks update their code to the correct paysplit and puzzle difficulty in order to continue participation on the main chain. Someone might be thinking – wouldn’t the larger miners want difficulty to be high so the smaller miners can’t compete with them? Well just like Bitcoin, payment is proportional to work done. Big miners can be outbid (in the sense that a miner can pay higher transactions fees to get its solution selected) by small miners easily. If difficulty is too high, the big miners don’t get paid as they never find golden ticket solutions. The optimal state is one solution per block with paysplit in equilibrium, and difficulty high enough to make reorganisation attacks prohibitively expensive. Thank you for reading to the end! Hopefully this clarifies more on how Saito’s paysplit and golden ticket work. Any further questions or thoughts, please do leave your comment below, and we’ll be sure to get back to you! And by all means, follow our social media channels, where all team updates/technical discussions are happening!